Tips for catching Tautog in Virginia. Tautog, or Blackfish as they are called in the northeast, is one of the favored targets of inshore anglers. Pier fisherman and boat anglers both have the opportunity to land these rock dwelling fish. WHAT: Tautog, or Tog for short, are a bottom dwelling fish. A member of the wrasse family, they are commonly found in the nearshore waters from the Carolinas to Nova Scotia. Their other aliases are “Black Porgy”, “Chub” and “Oyster-fish”. Tautog comes from the Narragansett word tautauog, which means “Sheepshead”, most likely for the Tog’s set of large conical front teeth. The teeth towards the back of the mouth resemble molars. Along with its other adaptation, thick rubbery lips, a Tog is able to pick and crush mollusks, crabs and other crustaceans. They have also developed a rubber skin which aids in swimming in and around rocky areas. Tog are dark brown to dark olive with white blotches. Females tend to be more mottled grey and black while males are generally dark all over. Females develop a white saddle down the center of there bodies during the spawn. They can average in size from 1 to 3 pounds, but many can exceed 9 pounds. The current IGFA World record sits at 25 pounds. It was landed off Ocean City, NJ in 1998. WHEN: Tog season usually runs from late Fall to Spring. Tog are resident fish and don’t move far to breed. Togs are generally in the area the entire year, but the reason for the short season is the addition of other bait stealing fish to the Tog grounds during the warmer months. This increases the competition for your baits and Togs aren’t known for venturing very far from their homes to nail bait, opening the door for the more aggressive fish like Sea Bass, and Croakers. Togs will move according to water temperatures heading to deeper water in cold months, but they don’t make mass migrations along the coast like Stripers. Water temps below 40 degrees will find most of the Togs hanging around nearshore wrecks in deeper water. During Virginia’s mild Winters, the Bay can remain productive the entire season. WHERE: Tog will inhabit wrecks, reefs, rock pilings, or any strong piece of bottom structure. They are very territorial and will remain in an area as long as they can find food. Fish that have been caught and released will return right back to their little piece of the rock. It is true that you can be catching fish on one side of the boat and not the other all depending on which angler is over the fish. Keep this information in mind as you’re targeting Togs. If you don’t have any hits in say 30 minutes, you need to move and find another fishing hole. Anchoring and re-anchoring is a given in targeting Togs. Around the Tidewater area, most Togs are taken over the tubes of the Chesapeake Bay Bridge Tunnel, or around its numerous pilings. The islands marking the entrances and exits of the tubes are surrounded by rocks. These rocks extend out over the actual tubes for quiet a distance. Its in these rocks over the tubes that Tog like to hangout. Positioning your boat right over the rocks is the tricky part. More on anchoring in the “How” section. Tog can also be targeted at the many nearshore wrecks that dot our coastline. 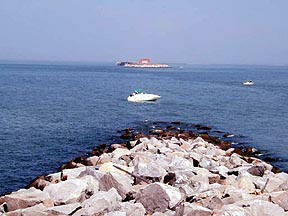 The Concrete Ships, Cape Henry Wreck, The Cell, and Back River Reef are other great inshore spots. The reefs around the Chesapeake Light Tower, the Triangle Wrecks, the Santore and several rock piles and drainage pipes along the oceanfront are just a few of the Tog’s other favorite haunts. HOW: Tog have a reputation for being somewhat difficult to catch. This is due to two basic reasons. One is that fact that they live among rocky, abrasive structure, making it a given that you will break off many rigs and fish. The second reason is how a Tog eats. Its difficult for anglers not to set the hook on the first tap of your bait. The angler must wait for the Tog to get the bait past its front teeth and deeper into its mouth before setting the hook. There is some learning curve for first time Tog anglers. Most anglers use a basic rig for Tog fishing. It consists of a length of mono or fluorocarbon with a dropper loop tied in the middle and a perfection loop on the end. The perfection loop is for the sinker. A hook, usually a J-hook from 1/0-4/0, is attached to the dropper loop by feeding the loop through the hook’s eye and around the hook. The Sinker is attached in the same way. The finished rig is usually 12-18 inches long with the hook falling just slightly above the top of the sinker. Hook size will depend on bait being used and the size of the fish being caught in the area. Sinker weight will be determined by current and depth of water. You want to have enough weight to have your rig nearly straight up and down below you. I usually use 40-60 pound fluorocarbon for my rigs. The rig is attached to the main line via a barrel swivel. Avoid using a lot of beads and terminal gear when making these Tog rigs. The more stuff, the easier it can be to get hung up on the rocks or wreck. This rig can also be made with 2 drop loops for an additional hook. Some also use a length of 80 pound mono or fluoro as a shock leader between the rig and the main line. You want your tackle to be on the heavy side, 20-30 pound class with a rod that has some backbone to it. You want to be able to lift the fish out of the rocks readily, avoiding break offs with the rocks or wrecks. When you get hung up, and you will, bouncing the sinker up and down, or if a fish is on, giving a little slack sometimes will allow the fish to swim out of its hole allowing for the fight to continue. You will use a lot of rigs, so have several made in advance. The favored bait list for Tog fishing includes quartered Blue Crabs, Marsh Crabs or Fiddler Crabs, Clams, Muscles, and Squid during aggressive feeding. Clams, or any soft bait, are cut into strips. 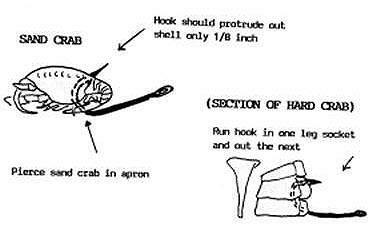 If using crabs, run the hook through a leg socket and out the back or next socket of the crab. Whole Fiddler Crabs can be used, Blue Crabs are cut into smaller sections. If you find that your rigs are spinning, remove the legs of the crabs. Getting close to the best fishing structure can be difficult at times. Using a wreck anchor is preferred when near rocks and wrecks. The bars on the wreck anchor will straighten out if needed to re-position Cleat off the anchor line and power off the rocks/wreck. 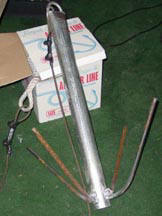 Another tip you can do is to attach your anchor chain to the prong end of the anchor instead of the normal shaft end. Then take your chain and run it up the shaft of the anchor and attach it to the shaft using a zip tie, making it look like the normal anchor configuration. Set the anchor as normal. When its time to move, pull on the line and the zip tie will break allowing you to pull the anchor out backwards out of its hold. As I said earlier, anchoring and re-anchoring are a must in Tog fishing. They can concentrate in very small areas, so finding them can mean moving frequently. Once over the bottom, and you’re ready to fish, drop your baits. Be prepared to take up all slack once the sinker hits the bottom. When a fish picks up the bait, give it a second or two to get it to the back of its mouth. Less time is needed if using soft baits like clams and squid. Then set the hook and lift the rod pulling the fish out of its cover. Tog fishing is not a “Set-it-and-forget-it” outing. You have to be on your toes and ready to strike at all times. One of the best things about Tog is its taste. It has been equaled to the taste of Red Snapper. It’s a great chowder fish since it has a firm and mild tasting meat. It can also be baked, broiled, or grilled and can be a great substitute for any Striper recipe.